The first Season in Diablo III has proven a big success, with many players choosing to only play Seasonal characters. At Diablo Somepage we track both the standard and Seasonal Paragon Levels, and now provide charts that show the history of Paragon Level data. We will mark the end of Season 1 when it arrives, and continue into Season 2. Take a look at the history for Diablo III players who have obtained many Paragon Levels, and add your own Diablo III BattleTag to have the history recorded going forward. Use the BattleTag Locator to see data from a Diablo III BattleTag! The chart above is for the Paragon Levels obtained by Gabynator #1902, a top Paragon Level BattleTag. After getting a whopping 1030 standard softcore Paragon Levels, Gabynator switched over and obtained 804 Seasonal softcore Paragon Levels. Given how much experience is required for Paragon Levels beyond 1000, we project that those will combine to equal Paragon Level 1089 after Season 1 is over. We record the Paragon Levels every time a Diablo III BattleTag is updated in our database. All the BattleTags that we know about are scanned automatically at least twice a week, but they can also be updated manually at any time, with the Update Now button on each account page. 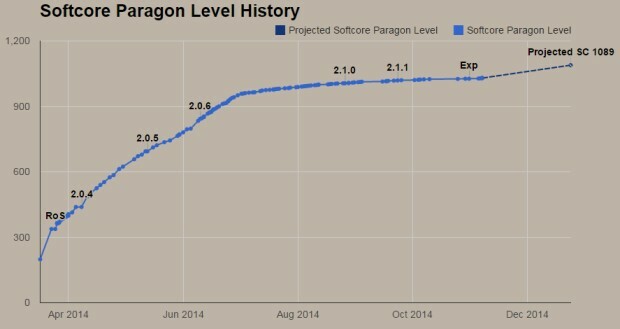 The Paragon Level history charts reflect the patch dates and experience bonus community buffs. This makes it easier to see why an account leveled, when it did. The projected Paragon Level after Season 1 ends is listed at the right side of each chart, whenever Seasonal Paragon Levels have been obtained. Another example of Seasonal Paragon Levels can be seen with the BattleTag RYNO#1946. This Diablo III account went completely into the Season, deleting all the non-Seasonal characters on the account. 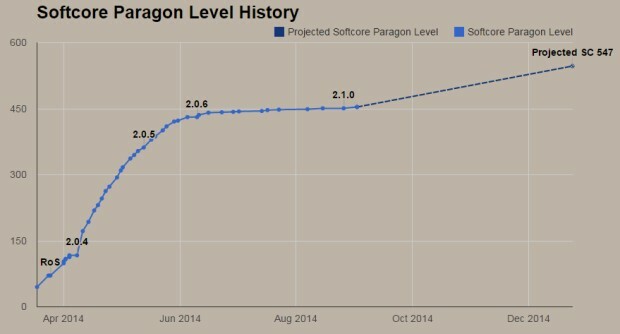 The standard softcore Paragon Levels of 454, plus the Seasonal softcore Paragon Levels of 422, are projected to combine into 547 Paragon Levels at the end of the season. You can put your Diablo III BattleTag into the BattleTag Locator, to find your account if we have it, or add it for us to track. We will show the charts for Paragon Level history once we record it, after an account has obtained new Paragon Levels; the history chart only shows up once we have multiple history data points. At the end of Season 1, all the Seasonal Paragon Levels will automatically roll over into the main Paragon Level pool. When that happens, our charts will be updated to show the jump from the Season 1 Paragon Levels being added... and then it will start all over, for Season 2! Get all the important Diablo III news, and find out about our latest charts and guides. Follow Diablo Somepage on Twitter, Facebook, or Google+ for updates.